With the left already, believe it or not, rushing to blame the unrest in Egypt on the dastardly combination of income inequality — "Egypt's top quintile of earners has increased its share of income since the 1990s, while the country's bottom quintile has seen its portion of the pie get smaller" — and "commodity speculation by hedge funds," it's worth getting into the economic explanations from a free-market perspective. The more one looks into it, the more one finds that Egypt bears the scars of socialism. This dispatch from Time magazine from 1962 tells the story aptly: "For most of the past decade, Gamal Abdel Nasser's one-man rule of Egypt has rested on a two-word slogan: 'Arab socialism.' Brandishing this vague concept, Nasser has expropriated private property..."
Government-backed 'Alternative' energy: The Soviet-funded Aswan Dam at its peak produced nearly half of Egypt's electricity via hydroelectric power (no greenhouse gases!). gentrification is a concern for downtown residents, many of whose families have enjoyed rock-bottom prices for half a century because of rent-control laws. Spacious, centrally located apartments are passed down from one generation to the next, some of whom still rent for only a few dollars per month. The system made owning property a losing venture. Many blame the outdated property law for the shabby, decrepit appearance of Cairo's Belle Epoque apartment blocks. "Everybody would like to have an exit from this law, but you know very well that this is a very political and sensitive issue," said Mustafa Madbouly, the chief planner for the ministry of housing. "We don't have a clear timeframe as to when this will be implemented, this abolishing the rent-control thing. It is still under study, whether it is the ruling party or the government, because there is a lot of social consequences if you abolish this kind of law." There are apparently a lot of social consequences for not abolishing it, too. In state-owned Al-Akhbar as well as Al-Ahram, bread prices top the front page of both papers. "No increase in the price of subsidized bread," Al-Akhbar writes. The paper adds, from the mouth of Egypt's premiere, Ahmed Nazif, that the state will absorb any increase in international prices of wheat. Nazif also pledged that the government will take steps to guarantee the sufficiency of food supplies during the Muslim month of Ramadan. Al-Ahram's headline reads: "No Change in subsidized bread prices under any conditions." When the government rather than markets set prices, it's hard to sustain. Tax Increases: Egypt's tobacco tax increased 40% on July 1, 2010. Egypt imposed a new real estate tax in 2008. The government also tried to increase the tax on truck freight and to increase taxes on cement and molasses. Egyptian government officials were open about their goal of raising tax revenues. 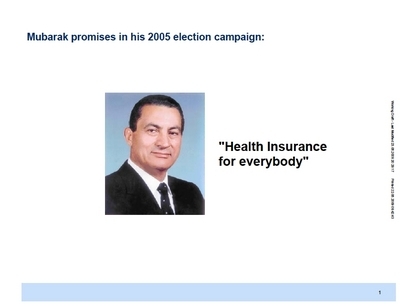 In a June 2007 presentation on the "Egyptian Tax Reform Agenda," the deputy minister for tax policy in Egypt's finance ministry, Ashraf Al Arabi, listed the "first goal" of Egypt's tax reform as "increase tax revenues." He proceeded to brag that after the "reform," "income tax revenue grew as a share of GDP." I don't mean to belittle the desire of Egyptians for political freedom. But this is a once-prosperous country that has become decrepit in part because of socialist policies. My former Forward colleague Lucette Lagnado's book about her father, The Man in the White Sharkskin Suit: A Jewish Family's Exodus from Old Cairo to the New World has been translated into Arabic and is selling well in Egypt, perhaps not because the Egyptians are all so interested in the Jews, but rather because the book tells about Cairo before Nasser's socialism ruined it. The Egyptians massing in the streets yearn for not only freedom of expression but the jobs and prosperity that economic freedom brings but that socialism destroys.